There can hardly be a greater task in 20th century world history than to understand the Holocaust and the Gulag. Why did these related extermination projects happen, and how did similar phenomena occur in other parts of communist Europe in the early 1950s and in Cambodia in the 1970s? We need to realize how the shock of the inhuman has probably had a more detrimental effect on Western culture and thought than any of the more common accounts of postmodernism. At the same time, if we are to resist using the word “evil” carelessly and want to preserve what remains of a good modernity, we must differentiate between the Nazi horror and what happened to Russia under Joseph Stalin. To understand the lower depths of the Russian experience is partly to understand the power and attraction of communism in that country over 75 years. Every culture has its own ideals and its own way with depravity. Anne Applebaum has spent the last several years researching and writing this first comprehensive history. “Gulag: A History” is a model of patient, readable scholarship. Lucid, painstakingly detailed, never sensational, it should have a place on every educated reader’s shelves. The gulag, named by Nobel Prize-winning author and dissident Alexander Solzhenitsyn, was the vast network of labor camps ranged across the bleakest parts of the Soviet Union. Although they functioned in one form or another roughly from the end of V.I. Lenin’s end until the beginning of Mikhail Gorbachev’s, Stalin’s name will forever be attached to the lethal years 1929 to 1953. During 1937 to 1938 and 1942 to 1943, the time of Stalin’s ideological purges and Russia’s worst war years, the political police recorded nearly 1,800,000 camp inmates, and these figures still don’t reflect the huge turnover of prisoners. In the year of Stalin’s death, 1953, the camps were at their largest and most terrible, with thousands of political deportees from Estonia, Poland, Czechoslovakia and other communist satellites swelling their numbers. Many memoirs tell the stories of Stalin’s arbitrary victims, people in the wrong country at the wrong time. Often, the foreign victims were people who had traveled to Russia to help realize the communist political ideal they cherished. Red Army officers who had been German prisoners of war were treated with gross injustice in the postwar camps, as, inevitably, were Russians who had fought with Adolf Hitler against Stalin. By the 1970s, the number of political prisoners had dwindled to about 20,000. But the gulag lasted right up to the end of the Soviet Union in 1991 and went on being relatively unknown, and unprotested, in the West. (In the winter of 1979, when U.S.-Soviet relations were at a nadir and I was a foreign correspondent in Moscow, what bothered visiting American congressmen was not the gulag but the issue of Jewish refuseniks’ not getting exit visas to Israel. Applebaum, an American journalist and scholar, has explicitly written her history to overcome that ignorance. It is not the case, as those who see communism as the equivalent of or worse than Nazism have argued, that Leonid Brezhnev’s Russia was Stalinist. Under communism, people slept more easily in their beds and led happier lives. Nevertheless, as Russia came under intense pressure from the West to live up to its human rights agreements, political prisoners were still tortured. Poet Joseph Brodsky, who later won the Nobel Prize for literature, lived to deliver his testimony. Dissident Anatoly Marchenko did not. Three years after Gorbachev’s general pardon for all political prisoners in 1986, an event that received surprisingly little attention in the foreign press, the KGB sent 2,000 people to psychiatric hospitals (psykhushki). Political arrests still happened in 1989. Then, finally, Russia became a free country. Since then a minority of historians and interested individuals have been combing the archives, trying to recover the past and creating the opportunity to mourn. The Russians evidently have difficulty coming to terms with the past. This disappoints Applebaum, but we should remember that the Germans spent 50 years mastering their own dark history. Germany was pointed in the right direction by its occupier-liberators, but the Russians have liberated themselves. So perhaps we should be patient. Because of the pervasive ignorance of the gulag, the positions of Europe and America in the Cold War need reexamining. America’s under-awareness of the gulag had to do with geographical distance but also with the reduction of the Soviet phenomenon to an unqualified political evil, which discouraged sympathy for mass injustice. At the same time, educated Americans imagined the fate of the Jews under Nazism so vividly that it became part of the domestic heritage. From the mid-1970s to the present, the Holocaust was the crime against humanity. There was no moral energy left over for the Russian tragedy. Ignorance in the outside world about the gulag persisted through the Cold War despite landmark accounts by writer-victims. Solzhenitsyn’s “One Day in the Life of Ivan Denisovich” even appeared in Russia in a short period of political opportunity in 1962, followed by his foreign-published novels “Cancer Ward,” “The First Circle” and his infinitely distressing memoir, “The Gulag Archipelago.” In “To Build a Castle — My Life as a Dissenter” (1978), Vladimir Bukovsky wrote of his torment at the mercy of politically motivated psychiatrists. Varlam Shalamov’s “Kolyma Tales” (1994) described daily life in Russia’s most notorious corrective hellhole inside the Arctic Circle. Applebaum, though, is not motivated only by Western ignorance. She deplores the fact that the crimes of Stalin should for so long have been minimized by the left in the West. It’s true that the difficulty of the elderly Jean-Paul Sartre and Simone de Beauvoir to accept what Solzhenitsyn wrote, after their long years of communist sympathizing, sticks in one’s gullet. For Applebaum, it is not just an American preoccupation with the Holocaust and a readiness to dismiss Russia as the evil empire but also the ardent desire of the intellectual left for socialism to work in Russia that have resulted in a lasting imbalance in East-West understanding. The first idea of the concentration camp, one learns, came to Russia from British practice in the Boer War and from German practice in southwest Africa. The name came from a Spanish practice of rounding up peasants to stop local insurgencies in Cuba in 1895. In Russia, it attached itself to the long czarist tradition of Siberian exile. Liberal-minded aristocrats, who staged a botched insurrection in 1825, became the first famous victims of the system (later to be followed by novelist Feodor Dostoevsky, who was sentenced to corrective labor for socialist agitation and wrote about it in “From the House of the Dead”). In the 19th and 20th centuries, almost as many Siberia-bound prisoners died on the ill-supplied journey as succumbed to prison or camp conditions. For those merely exiled, arriving in Siberia was almost a reprieve. Nevertheless, to understand the gulag and its czarist antecedents, one has to grasp that this brutal way of dealing with political prisoners and criminals had a much broader function in society than merely a penal one. For the country at large, the system had obvious social and economic benefits: Exiles created villages, took culture to huge empty areas that few Russians would settle willingly and created wealth by providing labor for expanding industries in mineral-rich areas. The British pursued such a penal-economic policy in Australia and Tasmania in the 19th century; only the Russians carried the practice on into the later 20th century. Today’s major industrial cities of Noril’sk, Vorkuta, Kolyma and Magadan, were camps originally built by prisoners and run by ex-prisoners. The gulag regimes became so cruel from about 1937 on that they were known as meat grinders.This was the watershed, Applebaum records, “the year that the Soviet camps … transformed themselves from indifferently managed prisons in which people died by accident into genuinely deadly camps where prisoners were deliberately worked to death, or actually murdered, in far larger number than they had been in the past.” On this record of human degradation, the gulag bears comparison with Auschwitz. What makes the phenomenon different overall, however, is how and why it came about. Everyone knows that Soviet economics were disastrous. But it is not widely known that the gulag was a version of that mind-boggling economic and organizational inefficiency, creatively accounted for by absurd inventions of political conspiracy. The early camps in the 1920s, with their theaters, fountains and parks, were in some ways more like collective farms than prisons. Designed more for political re-education than for punishment, they were meant to function as self-sufficient economic units, though they never did. But always, as the political climate worsened, the ideological and practical justification for the camps remained economic. The hundreds of thousands of arrests in the 1930s were based on quotas for the expertise required to man the growing “Camp-Industrial Complexes”: so many engineers here and lumberjacks there, doctors, metalworkers and so on. To mobilize mass productivity, to transfer manpower from one end of the country to another, was to build socialism and serve the motherland. The planners saw it this way and so did the majority of the population. Applebaum suggests that these Soviet thought processes, with the gulag at their center, were genuine on the part of both officialdom and people and that what went wrong — and where evil entered — was always in inefficient practice. This embattled, distorted, outrageous genuineness is why in Russia not only a shallow reluctance to confront the past but also real moral ambivalence surrounds the gulag disaster. When Solzhenitsyn first published “Ivan Denisovich,” former inmates leaped to the camps’ partial defense. Applebaum is in a slightly difficult position with this material, which, though it does not condone mass murder through the semi-willingness of many Russians, makes the gulag more intelligible than the Holocaust. If she wanted to add to that sad intelligibility, she could have said that Russian culture, under Christian influence, attaches the highest value to suffering as the means to the highest understanding of the human condition. “We suffer, therefore we are,” is how American scholar Daniel Rancour-Laferriere formulated an attitude no student of Russia’s fate in the 20th century can ignore. The true horror of the gulag lay in the way Russia’s culture and social-political organization could not constrain the growth of an inhuman fantasy. Human prisoners were treated as units of labor. By bizarrely misapplied logic, the camps ran into trouble with their central controllers because they had production goals they couldn’t meet because their inmates kept falling sick and dying. The gulag phenomenon was almost literally demented, as if Russia’s brain had been invaded by a demon seed. For this reviewer, the pride and self-belief that Soviet ideology generated, the willingness to make sacrifices for the collective good, has constantly to be kept in mind when judging the gulag. Applebaum might fear too many potential excuses lurking in the realms of psychology and ideology, but in fact they are lethal for the culture in which they make the gulag intelligible: One has only to think of the traditional Russian neglect of the individual or the Marxist ideological desire to strip men and women of their inner, potentially private, life. The “confessions” extracted by torture in the 1930s were designed to exterminate the inner man. The political authorities wanted to master the spheres of motive and of action, which they could not do except by destroying the person as such. Without making this point, Applebaum speaks of the right of every man and woman to lead his or her own life. Evil is not morally complex, but the nature of the society that sustained the gulag was. The difficulty of embracing absurdity alongside tragedy may be yet another reason why we lag so far behind in our understanding of this terrible aspect of the 20th century and why, happily, no Hollywood director has yet attempted the impossible. 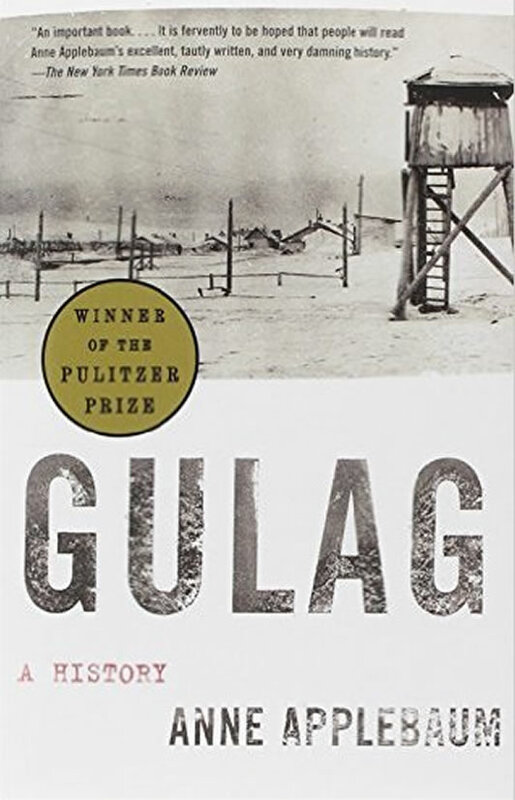 Applebaum’s “Gulag” is a work of history that does its own moral good. It says who were the victims and what happened to them. It persists in asking over and over why the West remains distanced from Russian history. Is it naiveté? How did it happen that Henry Wallace, the U.S. vice president when he visited Kolyma in May 1944, didn’t know he was visiting a prison? Is it ignorance? Applebaum suggests that for the Russians to invade Chechnya after Stalin had inflicted mass deportations and exile on the Chechens was as great a crime as if postwar Germany had invaded western Poland, and yet still few of us realize the seriousness of Soviet and post-Soviet crime. But I want to end by returning to the vexed Auschwitz comparison. The Nazi death camps and Stalin’s labor camps meted out the final solution to unwanted masses. Both phenomena were the extreme negative outcome of a mania in the 1930s for collective solutions to mass living and working. Both were tragedies of humanity, and each was a tragedy of its particular nation. There will be interpretations of both and illuminating parallels for years to come. But in the end, their histories will be best kept separate, for who can compare pain as the subject feels it? No historian, no onlooker, no book reader. As a writer-prisoner told Applebaum, as he cast a skeptical eye over the growing pile of files, statistics and books, the only person who can know was someone who was there.